Gray Falcon: Whatever Happened to MH17? Notice how it's been two weeks since we've heard anything about the Malaysian Airlines plane? For two weeks it was a media frenzy: "PUTIN DID IT", "PUTIN'S MISSILE", "PUTIN KILLED MY SON"? And then - nothing. When MH370 disappeared, the families of those aboard were a constant fixture on the screens. With MH17, they've been kept away. Perhaps so they couldn't ask uncomfortable questions, such as, "Why are you lying?" Can one even sign a non-disclosure agreement about evidence in a criminal investigation? And why would they - unless they were trying to hide it? As a reminder, all the data from the Air Traffic Control facilities that tracked MH17 was seized by the Kiev junta. The "black boxes" - flight data and voice recorders - recovered from the crash site were turned over to the Malaysians, who gave them to the Dutch, who promptly turned them over to the British! And while Washington claimed to have conclusive evidence the airliner was shot down by the Novorossians, it never produced any - aside from some Tweets and a couple faked YouTube videos. The junta was the one with the means, motive and opportunity to shoot down the airliner. It is trying to hide the evidence. After the initial frenzy of blaming the Russians with absolutely no evidence whatsoever, the Western media have stopped talking about the plane entirely. The truth points to itself. Falcon, an off topic comment. Why has the UN not seen fit to embargo/sanction Ukraine in the same way they cooked up Res. 752. Why are representatives of what passes for Ukraine still allowed to participate in various sporting events? They could barely hide their glee when they embargoed what was left of Jugoslavia. FIFA and UEFA could not jump fast or high enough to please the powers that be with suspention of FSJ. Kiev is shelling major cities in eastern Ukraine and it is business as usual. Kafkaesque, to say the least. Bearspaw, the answer is simple: the Ukies are "allies" (i.e. clients) of the Atlantic Empire, and therefore "good guys" who can do anything with impunity. 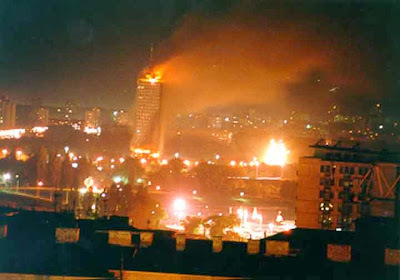 The Serbs in 1992 were "bad guys" and therefore anything they did (even allegedly) was evil by definition. I suppose Russia could ask for sanctions against the Ukie regime, but there's no need - Banderastan is imploding as it is. And Russia isn't trying to fight against the population of Ukraine, most of which is still culturally Russian. "Every 30-50 Years, The West Invades Us"